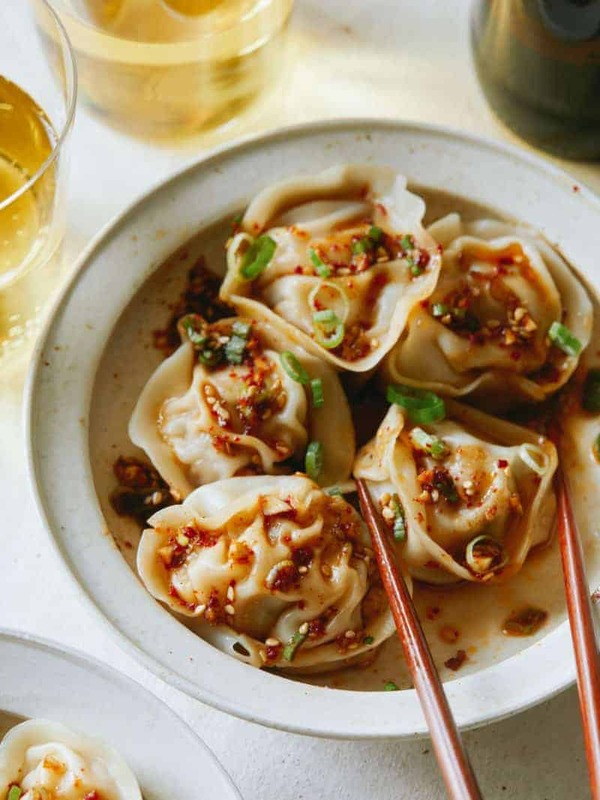 We’re staring this week off with dumplings! 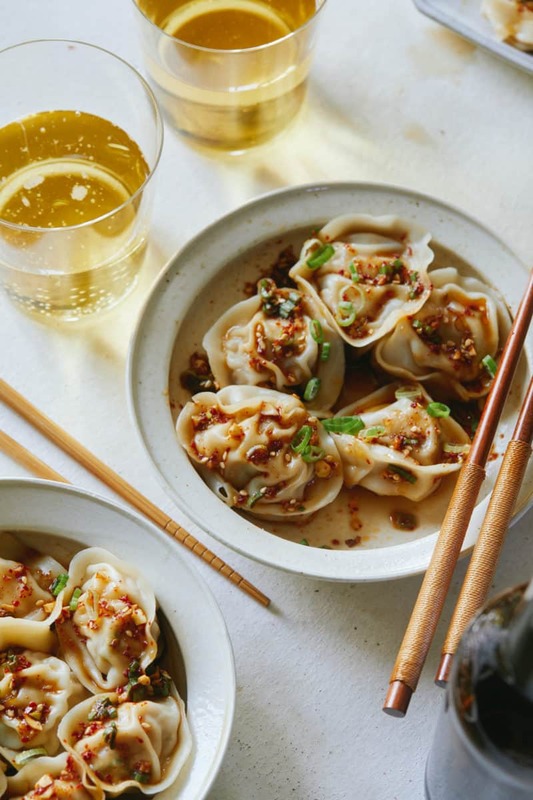 Dumplings, pot stickers, momos, etc…whatever you want to call them, they’re delicious. I think I could eat dumplings every single day and never get sick of them. There’s SO much you can do with them from deep frying to pan frying to steaming to boiling; plus there are SO many different flavor and filling combinations you can create! The filling we’re using today is so simple, but packed with tons of flavor. The chile-soy dipping (or drizzling) sauce we’re using is a classic Korean style dumpling sauce (or ‘ganjang’ in Korean). It’s my favorite dumpling sauce that I grew up with and it’s so so delicious. The only tricky ingredient to find might be the Korean Chile powder (gochugaru), but if you can’t find it cayenne pepper makes a fine substitute. 1. For sauce: In a small mixing bowl, whisk together all sauce ingredients. Set aside. 2. For filling: In a large mixing bowl, combine ground pork, shrimp, sesame oil, ginger, garlic, green onion, salt and pepper. Mix together until everything I evenly combined. 3. In a small bowl combine egg and 1 tablespoon water. Whisk together. 4. Brush the edge of a wonton wrapper with egg wash and fill the center with 1 1/2 tablespoons filling. 5. Fold dumpling in half, making sure to get rid of any air pockets before completely sealing. You should have a half circle at this point. Dip one corner of dumpling in egg wash. Bring both corners into the center of dumpling and seal together. 6. Repeat steps 4 and 5 until all filling and wrappers have been used. 7. Place a pot of water over high heat and top with a bamboo steamer. Line steamer with a steamer liner or leaves of green cabbage. 8. Add a few dumplings to the steamer about 1/2 inch apart. Cover and once water is boiling, steam dumpling for 7 to 9 minutes or until dumplings have cooked through completely. Transfer dumplings to a shallow bowl and repeat. 9. To serve: Drizzle sauce over steamed dumplings and serve with more sauce on the side. 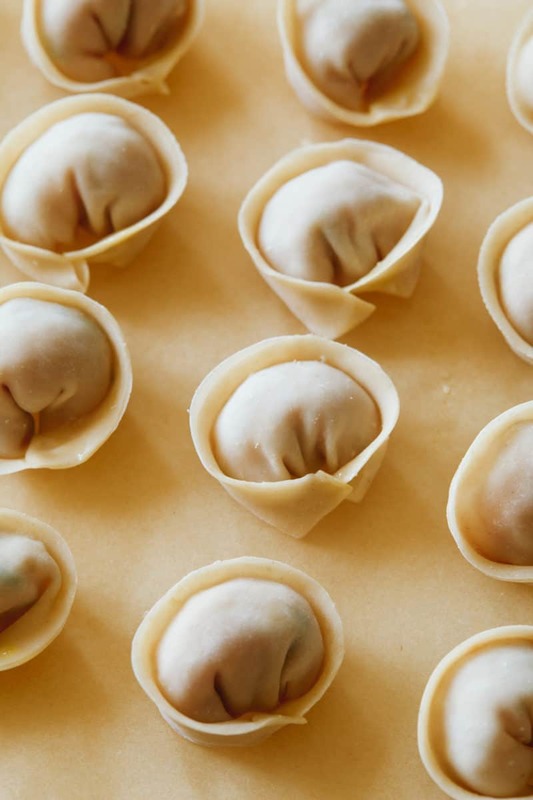 **If you want to create pretty pleats on your dumplings, like we did, you can watch this short video we grabbed from youtube to see how it’s done. Can these be frozen dyer cooking? Can these be pan fried?